Gerber is known for its legendary blades and is the undisputed manufacturer of knives, multi-tools and outdoor accessories in the US. Building on this success, Gerber has ambitions for the rest of the world, recently opening its first international HQ in Germany. Intuitive have supported Gerber from the outset, producing all of their international trade shows, events and supporting strategically with product design and marketing proposals. In 2012, we headed back to Germany to the idyllic town of Friedrichshafen, a mecca for outdoor enthusiasts and a fitting backdrop to this hugely important event. The stand was compact but highly versatile, designed around Gerber’s new logo to give the brand maximum visibility. Scenic graphics overlayed the Slatwalls with two touch-screens placed near the aisles so visitors could explore Gerber’s full portfolio online. Darkened smoked glass complemented the high-quality finish and encapsulated the semi-private meeting room. 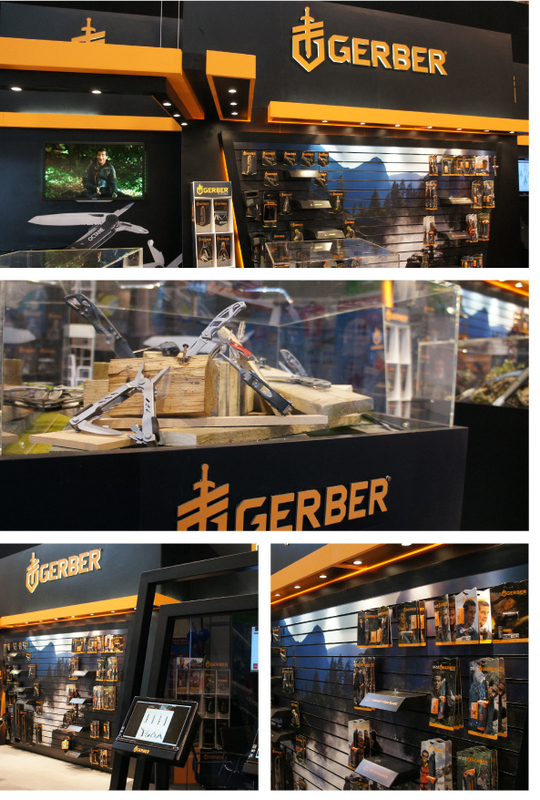 Two large wall-mounted LED screens ran eye-catching videos which draw visitors onto the stand and three showcases, fitted out with thematic props formed the stand’s centrepiece with integrated storage drawers so visitors could get hands on with what Gerber had to offer. The stand was a showcase for Gerber’s international intentions and our future designs will continue to evolve with Gerber’s as they expand into new, exciting markets. 2013 is already looking very promising!